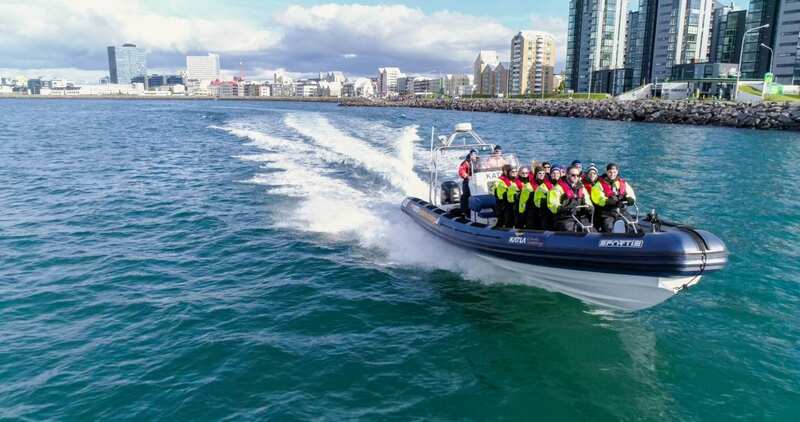 See Iceland's gentle giants from our spectacular and fast Rib boats which are brand new and equipped with 12 suspension seats to enhance your comfort, security and level of enjoyment. Rib boats are fast and offer a quick reaction so you're able to get close to the whales quickly which leads to a very special experience. The tour starts at Reykjavík Harbour and you sail up close to the famous Harpa – Concert Hall and the Sun Voyager. Next, you proceed to Faxaflói Bay for the search of the whales, where you will experience the amazing wildlife with many species of whales, dolphins and even seals to be found in these waters. Many of the 23 species of whales that are found around Iceland can be found in the bay. In addition, the area is home to millions of sea birds of various species, including the beautiful puffin. The puffin comes to lay their egg in many of the islands in the Faxaflói Bay and on this trip you will get close to some of the islands, one of these islands is named Lundey which means Puffin Island. The guide to client ratio (12 per guide) creates the special feeling of a small group experience. As well as answering your questions our guides will provide you with various information on the whales and other wildlife during the trip. To make the 1 1/2+ hour trip as comfortable as possible, you will get a warm waterproof overall (dry suit), life jacket, googles and your own Katla Whale Watching buff/scarf. 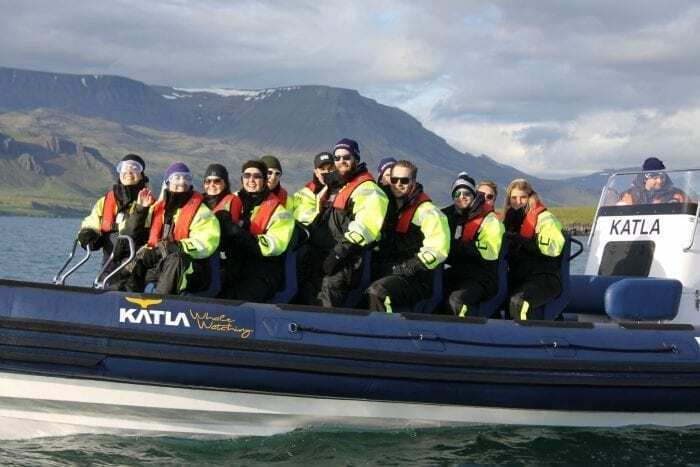 When going out to search for the gentle giants we are highly optimistic, but unfortunately, it's harder to spot the whales at sea than in the oceanarium and the weather here in Iceland can be unpredictable. Hop on board on this amazing nature experience, the fastest way to see whales, puffins and the city. Check availability by choosing a date. Dress warmly and bring your best mood!